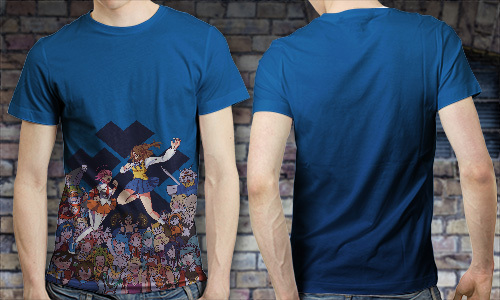 Skprint.com offers all over art shirt to those who want to use their personal artworks as graphic designs for their garments or t-shirts. Such product will always be an excellent choice for someone who wants to be unique and special in the eyes of other people at all times. It was designed to promote dye sub printing and to surpass the quality of all graphic designs that can be printed on a t-shirt through silk-screen printing. It exhibits great innovation and we usually perform it with the use of our most advanced dye sub printing kits that can never be found in the other famous providers of dye sub printing service all over the country. You can send to us the digital copy of the artwork that you would like to use as a graphic design if you want to buy a sample of all over art shirt here at Skprint.com. We assure to you that our tools and dye sub printing kits will make your artwork more realistic and elegant once it has been printed on the all over art shirt that you would like to receive. Place you order now for your first all over art shirt here in our website and be amazed with the outstanding quality of the direct dye sub printing service for garments that we can offer. We offer this product to satisfy the needs of all individuals who want to save more money and time in the process of acquiring their dream t-shirts and garments. 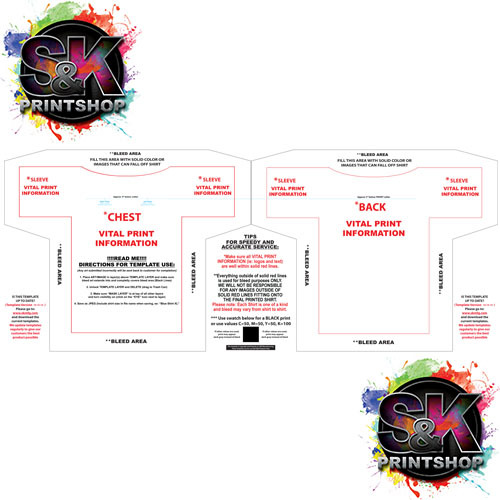 Click Here to get a FREE quote from S&K for next All-Over Art Shirt printing job! 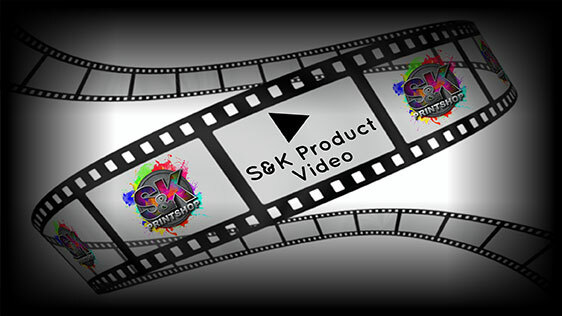 As this is a large item, it will require a large sized heat press to complete this product if S&K will not be pressing this item for you. All of our products come with a possible 10% quantity +/- increase/decrease total. These will be mostly seen with larger quantity items such as our stickers/decals, dye sub transfer sheets, mousepads, etc where there are high quantities with the same artwork on each item. The customer will be responsible for any charges for these overages at the same rate per item along with rest of the quoted order. This template WILL NOT fit on a 16"x20" Press! As the shirts for the All-Over Art Shirts will be full bleed, the press that is used for this type of product must be larger than the actual size of the shirt that is being used. Most 16"x20" presses WILL NOT be able to press an All-Over Art Shirt!